Integra Homes has reserved 10 residential lots with mountain and forest views in Cambridge Park Estates within the Crown Isle community. They are accepting reservations for building new custom homes in this new neighbourhood. You can choose one of the many lots that Integra Homes has reserved or you can choose from any of the available lots that are remaining. 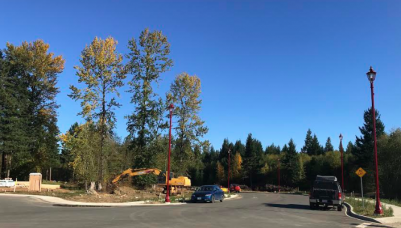 Many of these lots will have homes built on them that will back onto the nature park providing residents with privacy and a view of the forest. 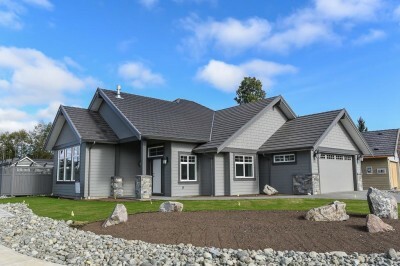 Integra Homes also have a few lots reserved that will give new custom homeowners unobstructed views of the Comox Glacier providing stunning scenery on a year-round basis. Enjoy the view of the Comox Glacier, the Crown Isle golf fairways and the forested park from this location. Choose your lot and combine it with one of the many custom home plans and you can be living in the Comox Valley, on Vancouver Island by the end of 2019! Living in the Crown Isle community Courtenay embodies West Coast living on beautiful Vancouver Island. Enjoy the temperate climate and world-class scenery all year round. Walking trails are at your doorstep and the Crown Isle clubhouse, shopping centre, Aquatic Centre, and Comox Valley Hospital are just minutes away. 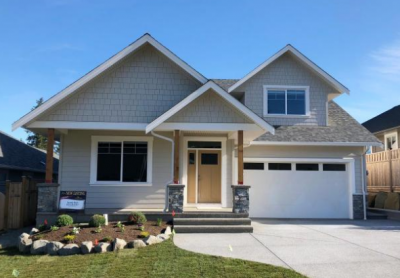 Custom Builder, Jayson Welsh with Homes by Crown Isle has a new home for sale in the popular subdivision known as THE RISE in the Crown Isle community on Vancouver Island. This spacious 1,966 square foot two-storey home is designed and built with today's open concept styling in mind. The modern, elegant kitchen features two-toned cabinetry finishing in white and navy blue, elegant lighting fixtures and a full Whirlpool stainless steel appliance package including fridge, gas range, microwave, dishwasher and side by side washer and dryer. The 18'6" by 12' master bedroom on the main floor features modern sliding barn doors to access the ensuite and the two separate his & hers walk-in closets. The home also includes an additional bedroom and full bathroom on the main floor plus a large bonus room and bathroom upstairs. The exterior of the home includes Hardi plank siding with rock features and a beautiful covered entry and large rear covered deck. The two car garage and a large driveway allow for plenty of parking. The front and rear yard are landscaped including underground irrigation. The rear yard is fenced and ready for additional vegetation in the garden beds to fit your personal tastes. Homes by Crown Isle, a premier custom builder in the Crown Isle community, has a new home for sale located at 1055 Crown Isle Blvd. in Courtenay, BC. Set in The Rise subdivision of the Crown Isle Golf Course and Resort community, this spacious 1,966 square foot two-storey home offers three bedrooms and three bathrooms, including a large 18'6" by 12' master bedroom with ensuite. Location: 1055 Crown Isle Blvd. in Courtenay, BC. Additionally, a stunning new rancher home located in the quiet and gated community of Hampton Gate in the Crown Isle Golf community is now ready for occupancy. This new home for sale is located in a prime location, close to the 16th fairway of the Crown Isle Golf Course. Spectacular views are seen from the main living, master bedroom and covered outdoor patio. 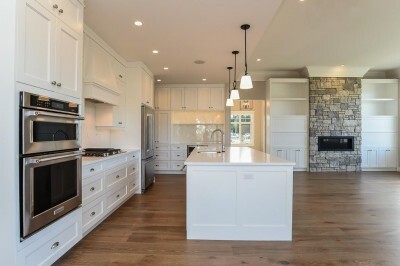 Quality finishing includes granite and quartz countertops, lacquered custom cabinets, a large kitchen island with seating in an open plan kitchen. Finished in contemporary colours and design this kitchen will inspire you to cook and entertain. All of the LG appliances are included in the price. This home is ready for you to move right in! 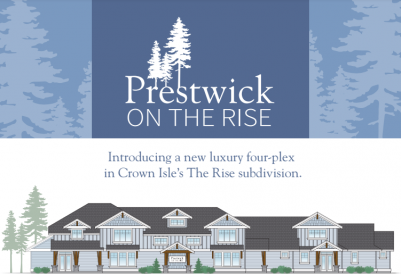 Realtor Bert Jaeger, Crown Isle Realty Ltd.
Homes by Crown Isle is putting the finishing touches on their newest project of luxury townhouses called "Prestwick ON THE RISE". This four-plex is located in Phase II of The RISE development of the Crown Isle Community. The views of the mainland coastal mountains and Georgia Strait from the second floor are amazing. Currently, three of the four units have accepted offers, leaving Unit D available. This beautifully designed homes features 1,877 sq. ft. on two floors, with all three bedrooms and two bathrooms located on the second floor. 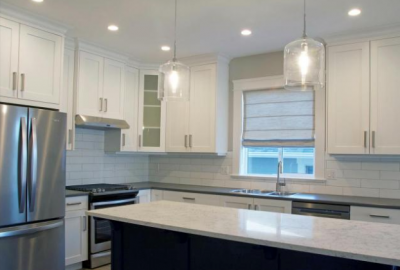 This home also includes a five piece Whirlpool appliance package, a gas fireplace, quartz countertops, maple shaker style white cabinets with a custom tiled back splash, a covered outdoor patio and more. The tile floors have radiant in-floor heating. Priced at: $529,900. For more information on new home construction in the Comox Valley, contact Jason Andrew, Director of Real Estate, or Bert Jaeger, Realtor for Crown Isle Realty Ltd. who are both familiar with the community's history as well as what is planned for the future. Both Jason and Bert are true experts in the Crown Isle Community lifestyle considering they both live, work and play golf within the Community. No one knows Crown Isle like they do! Bert Jaeger, Realtor, Crown Isle Realty Ltd. The Rise - Lot servicing and road construction for Phase III and IV at The Rise in Crown Isle is now complete and Silverado Land Corp. is expecting to receive registration in the next few weeks. Builders are expected to submit building permit applications for new homes in November. To date, approximately 59 of the 69 lots have been reserved by future homeowners and home builders. This new extension of The Rise is located on the north/west side of Ryan Road in Courtenay, B.C. Some of the new home lots feature spectacular views of the mainland mountains and of the ocean. Prices for the remaining lots start at $195,000. 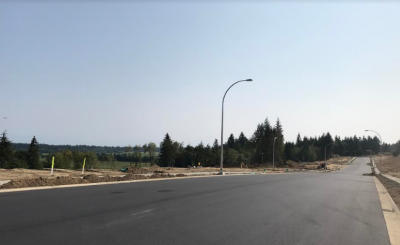 Cambridge Park Estates - Construction is nearing completion of the final new phase of Crown Isle Drive, which will link to the south end of Crown Isle Drive near Kensington Crescent. Curbing and sidewalks are being installed and paving is set to begin in the next few weeks. Some of these lots are located on the golf course side, with views of the Comox Glacier and of the golf course. Registration is expected in November for the 67 lots. Lots are will range in price, starting at $250,000. Contact Crown Isle Realty soon to receive more information, as these lots are going fast! Construction of new homes is expected to be underway in December. Come and visit the newest Crown Isle residential communities in Courtenay on beautiful Vancouver Island. This is truly West Coast living! Come and visit Crown Isle and Comox Valley on beautiful Vancouver Island. This is truly West Coast living! 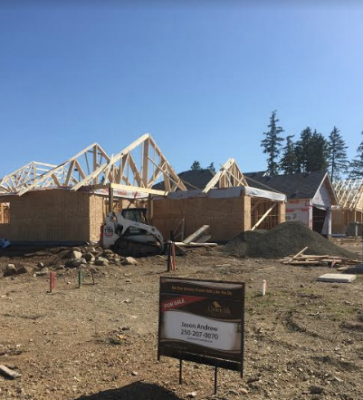 Construction continues as the walls are up and trusses are being installed on Homes by Crown Isle's "Prestwick on the RISE" Four-Plex in Phase II of the RISE development on Crown Isle property on the north side of Ryan Road in Courtenay. Construction is scheduled to be complete in September. Views of the Coastal Mountains and the Salish Sea from the second floor are amazing. Currently, two of the four units have accepted offers, leaving just Units B & D available. These remaining townhomes vary in size from 1,666 to 1,877 sq. ft. and prices are $489,900 and $529,900. 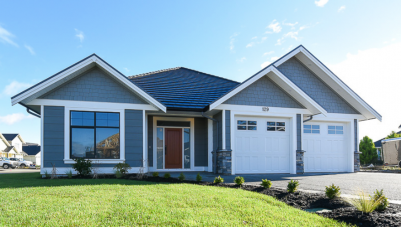 For more information on new home construction in the Comox Valley, contact Jason Andrew, Director of Real Estate, or Sandy Bain, Realtor for Crown Isle Realty Ltd. whom are both familiar with the community's history as well as what is planned for the future. Both Jason and Sandy are true experts in the Crown Isle Community, as they both live, work and play golf within the Community. No one knows Crown Isle like they do! Bert Jaeger first joined the team at Crown Isle in the spring of 2000, working for 15 years as a Golf Pro, teaching golf to players of all ages. Not only does he live within the community, but he’s watched it grow and has been an integral part of it along the way. 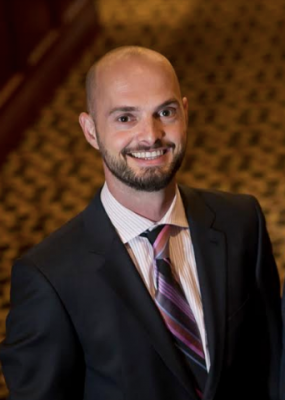 Bert joined the Real Estate division in early 2015 and has worked very hard to become one of the Comox Valley’s top Realtors over the past few years. Bert’s strong work ethic, attention to detail, and extensive knowledge of the Crown Isle Community and Comox Valley are only a few of the reasons that make him a valuable agent to have working on your behalf. Bert is excited to assist residents in selling their home and helping new residents find their dream home. Bert currently has several beautiful homes listed within the Crown Isle Community. These homes include include newly constructed homes and resale properties. Have a look at 3288 Majestic Drive, a 2,373 sq. ft. rancher featuring three bedrooms, two baths and a large garage. They also have a beautiful new home with a bonus room located at 1881 Crown Isle Drive. Road works and site preparation are underway for two new subdivisions being built in the Crown Isle Golf Course and Resort Community. The RISE Phase III & IV (69 Lots total) are scheduled to be completed sometime in June / early July of 2018. And the final extension of Crown Isle Drive - Cambridge Park Estates Phases V & VI (67 Lots total) is following close behind, with registration expected in the late fall. Lot prices in The Rise start at $195,000 while lot prices in Cambridge Park Estates start at $250,000. Contact Jason Andrew, Director of Real Estate, or Bert Jaeger, Realtor for Crown Isle Realty Ltd. Both Jason and Bert are true experts in the Crown Isle Community, having both started their careers at Crown Isle as golf professionals nearly 20 years ago before moving into the Real Estate Division. They live, work and play golf in the Crown Isle Resort and Golf Community and know the lifestyle. They have 40 years of combined experience working for Crown Isle and are familiar with the community history as well as what is planned for the future. No one knows Crown Isle like they do! Home construction in the Crown Isle Resort & Golf Community began over 25 years ago and the community has stood the test of time. The owners and development team behind the residential community believe much of the community's success can be attributed its Registered Building Scheme & Design Guidelines which ensure consistency and quality, while helping to maintain property values within the master-planned golf community. The Community boasts wide, meandering roads which provide a spacious and scenic feel throughout the neighbourhood. Single family homes, patio homes and condominiums are situated on and around the golf course. Golf course and mountain views abound from many of the established homes and available building lots throughout the community. 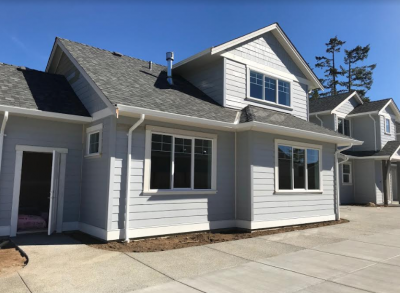 With the increase in demand for newly constructed homes in this desirable community, Crown Isle now has 14 different approved builders constructing new homes to meet the demand for new residents moving into the community. Find out more about about the Crown Isle community from this video. The Comox Valley real estate market continues to be very active according to the June, 2017 report from the Vancouver Island Real Estate Board (VIREB). And prices continue to rise, with VIREB reporting a 21% increase in prices this year compared to 2016. Currently there are 37 listings within the Crown Isle Resort and Golf Community for single family homes, patio homes and condominiums. Twelve of these listings are new homes being built in The Rise, one of Crown Isle’s newest subdivisions. In addition to this subdivision, Crown Isle also has three more subdivisions in for approval at the City, with construction anticipated to begin later this fall and into the spring of 2108. If you are interested in new building lots or homes within these new areas or elsewhere in Crown Isle, their real estate team is developing a “leads list” in order to keep potential new residents informed. Please contact them today so that you can be one of the first people to find out about the new building lots and real estate opportunities in the Crown Isle Community. Builders and private clients have spoken for all of the available inventory of lots that have been registered within the Crown Isle Community. More opportunities are on the horizon as one subdivision is being completed and there are plans in the works for additional lots to be built. Hampton Gate, Phase 2 is now registered - five new homes are set to begin construction within the next two months. There are several "Build to Suit" lots with Homes by Crown Isle , Integra Homes and Omnix Properites. Currently five lots remain for sale, with prices starting at $299,900. Also, preliminary layout approval has been received on 3 more subdivisions. There will be an additional 69 lots in the next phase of The Rise, 67 lots on the extension of Crown Isle Drive and 17 larger estate lots bordering on the 14th, 15th and 16th fairways on the golf course. Site servicing is scheduled to begin in late summer or early fall of 2017 and registration is expected to be completed late 2017 or early 2018. Pricing of these lots is to be determined. Please contact the Real Estate team to receive up-to-date information on these new lots in the Crown Isle Resort and Golf Community. 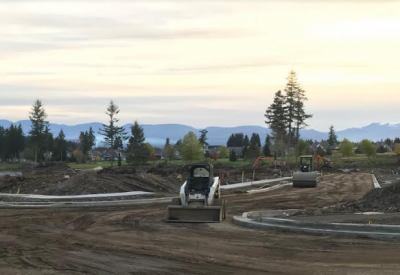 Due to unprecedented sales of lots and new homes in the Crown Isle Community on Vancouver Island, this golf course development is moving ahead to develop three more subdivisions. The developers are planning an additional 150 new lots in the next few years years. Contact the real estate team at Crown Isle to add your name to their growing list of potential new Crown Isle homeowners for one of these new subdivisions. Or if you’re ready to start building now, they can assist you with selecting a lot from their existing inventory. The Crown Isle development is ideally situated in Courtenay in the Comox Valley. 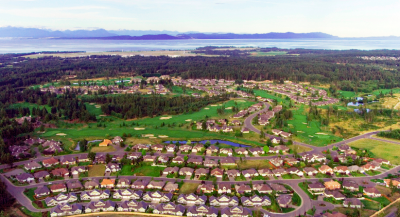 Built around a championship 18-hole golf course, the community is conveniently located next to shopping, schools, community amenities and even the new Comox Valley Hospital. The Crown Isle real state team can also assist you with selecting one of the premier builders who are building new custom homes within the community. Contact them now for more information. 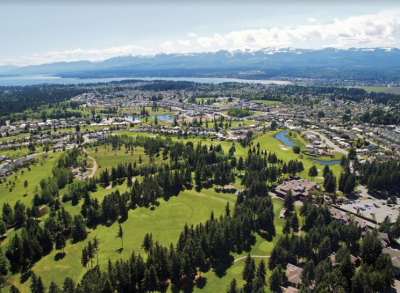 The Crown Isle Resort and Golf Community in Courtenay continues with plans to develop more residential lots to meet unprecedented demand in this well-established master-planned community. Phase III of Crown Isle Drive has only one of 14 lots available. Other lots have been sold or have been reserved by local builders, who are ready to build new custom homes for clients. One new home is already under construction in this subdivision. Construction is also underway at Crown Isle’s only gated single-family home subdivision, Hampton Gate. Here Phase II will include 25 lots and construction is underway – road work and site servicing is happening now, with street paving expected to be underway this spring. To date, 19 of the 25 lots have been reserved with many of the lots held by custom builders waiting patiently to help design and construct custom homes for future residents. Lake and golf course views as well as mountain views are available from these new lots. Lots in Hampton Gate Phase I are now sold out. With a busy spring expected for new home construction, now is the time to talk to Crown Isle’s real estate team, and learn about the subdivisions, builders and home plans available. Crown Isle Resort and Golf Community’s newest development The RISE is now building Phase II. The lots have been registered and construction of new homes has begun. 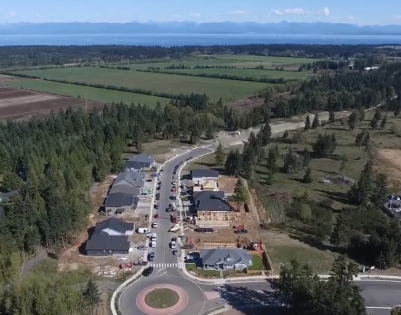 A total of 27 of the 28 lots have been spoken for by six different local custom home builders (Homes by Crown Isle, Integra Homes, Monterra Builders, Comox Builders, Comox Valley Construction and Cameron Contracting). Some of these builders have already started on both spec and custom homes, and a number of new show homes are planned for the summer. Crown Isle Homes is planning to construct a unique fourplex on Lot 28 bordering the traffic circle. This home will offer some ocean views. Phase I of The RISE has one lot remaining for sale (Lot 15). Spec homes are under construction on Lots 4 (Grand Legacy Homes) and Lot 14 (Crown Isle Homes). Additional spec homes should also be underway with the next few months on lots 17, 18 and 25.